What did I do all weekend? It turned out to be a crazy busy weekend,. DD1 decided to come home for the weekend as she had a dr appointment on Monday. She arrived home Sat am. I made all kinds of "tailgate" foods and we ate and watched the MSU game. Of course there was laundry as well, what were you thinking? I *never* just sit, and I bet none of you do either! Saturday night I sewed a little bit on the blocks for Karen and Cory's quilt (I bet you all forgot about that one, huh?) I also traced all the owls and cut out all the little owl parts. I read my book and look who kept me company the entire time! Mosen was more than happy to take my place once I got up. I had sent away for the "Creepy Squirrel" that I saw on Kim's blog and here he is in all his glorious creepyness. Don't you just love him? Sunday morning was great. I got up and worked on the fourth block in the Designer Sampler BOM. It turned out quite nicely I think. I also mansaged to get another orphan star done and finished the Big Ten block of applique. I had to applique all the school symbols around the block and put the sashings on. Then we had the doctor appointment for DD. Poor DD she is having a difficult time with that time of the month. She experiences so much pain she often is incapacitated, so off to the dr. Well, said dr is having her come back on Monday next week for blood work and an ultrasound (transvaginal) so we will see how she does. They want to rule out ovarian cysts before any hormonal therapy. I gave LTW my quilting plan for the M string quilt and she didn't expire. Then I gave her my quilting plan for the Witch's Pantry. All she said is :"You don't want it for this Halloween do you?" Well with as much work as it is all I have to say is "DUH!" If anyone can do what I asked she can. I can't wait to show you what I planned. LTW has my crude drawing so we will see how it goes. I have my friend, Robin print out a picture of the quilt and lighten it up and then draw how I want it quilted. This way I can give it to LTW and she can make it happen. I did forget to talk about thread with her but I know she will ask before she begins. I had to stop by the LQS to get border fabric for the Big Ten quilt. They should never let me shop alone! I did manage to get the border fabirc as well as several other fabrics for the BTQ next year. Now we are only lacking a few and we won't have to scramble as much. I had one helacious day at work yesterday and when I got home what was waiting in my mail? Why this amazing package from Annemiek from Holland. We were both amazed by Patti's red and white quilt and Annemiek went ahead and already made her own. When I expressed how wonderful hers was she offered to draw it up in EQ and share it with me. So she sent it all the way from Holland and in addition she sent 2 beautiful red and white fat quarters. There is a story behind those too and Annemiek said, "The "white" one is a so called "Fries roosje". fries from Friesland, a northern province of my country. Roosje means little rose. In the old days it was used as bed linen. black roses if you were in mourning, blue for "medium" mourning and red for "normal" life. Isn't it amazing that the people not only changed the colors of their (traditional) clothing when they lost a loved one, but also their bed linen?" "The fabric is very (old) dutch, although nowadays manufactured in Germany by Westfalen fabrics. The red one is from the same Dutch series." It is indeed interesting to learn the cultural traditions of a country other than your own, thank you Annemiek for being so generous and sharing your gifts (and fabric) with me!! I have been collecting red and white fabrics for a little while now but we will see how long it takes to get to it. It's in the que!! DH is coming home from a week long vacation in very northern Canada with 3 of his uncles. It is a very remote cabin in a national forest. I went with him once and it is beautiful, but you take logging roads to the edge of the lake, put yourself and your stuff in a small row boat and go across the lake. Then you take yourself and your stuff out, portage across some land and put it all back in the boat. You then motor across another lake to the cabin. Needless to say we have not been in contact all week. It is weird. He travels all the time for work and is gone a lot but we usually talk every day. I don't think that in 25 years of marriage I have ever not spoken with him for an entire week. I have to say I don't like it and I was quite surprised to find out that it made me miss him all the more. Odd huh? Anyone else ever experience that? I am excited he is coming home tonight!! The tail end of the week for me last week involved LTW bringing me bolts of fabric that a friend of hers gave her. She was sharing with me and my friends and the CL's and wasn't that the nicest thing? Her friend was going out of business and has just this last little bits of fabric to get rid of and so they shared. I took Friday off of work to go and see DD2 at MSU. So of course I made a shop hop out of it! I got these lovely fabrics at the second shop, Wendy's Simple Stitching and Country Stitches. I can't tell you what I intend to use them for as it is a secret. Just remember that you saw them. I just love this little owl and thought this would be great to make it out of. Now I need to fill it in with more from the line. I just fell in love with these little gremlins. Not sure what I will do with them. The Halloween fabric is a back for another Halloween project and how could I pass up the blue and green yumminess?? I just ADORE this pattern, but had nothing of these colors in my stash. It is a fairly big quilt, like twin size. I guess I thought it would be wall hanging size but isn't it cute? I found the pattern online. Anyway, I had fun with DD2 too. We went shopping at the mall and she got some new jeans. I asked her if she wanted to call the BF to go out with us but she didn't want to share her time with me with him! I did insist, after he texted and asked her if she wanted to eat beans and weenies with him for dinner, that she call and invite him out for dinner with us. We went to the Olive Garden and had a nice dinner. Then she went back to her house with him and I drove home. All in all a great day! On Saturday, Aiden was in this box that I brought home from DD's place. This box was not without a cat in it all weekend! She was taking a quick cat bath here. I did work on the centers for the Big Ten blocks and got them all stitched down. I thought you might like to see these two after LTW got done with the embroidery work. Neat, huh? I made the Big Ten block since I need to applique all the emblems all over it. They are just set in place as I was missing the OSU bit. I picked it up at work today and will have it for placement tonight. I know that I skipped over Sat but we had QTYW day and there were only 2 others besides me. I even went out and bought stuff for lunch (figuring people would stay longer if there was food) but just Ruth Ann and Mary and I were there to eat it. I did manage to get 2 sets of the Chubby chicks quilt cut out though. I still need to trace the actual chicks onto fusible but I got all the pieced parts cut. I had even bought some w-o-w fabric on Friday that looked like chick feathers to use in the one I am keeping! Then I went home and watched the MSU Notre Dame football game, we won which was awesome! I am meeting Yuki for dinner tonight so will have that to share tomorrow. Have a great day!! Last night I had quilting again. This time it was with the Cherry Hill Village Quilters (CHVQ). We meet in the CHV Theatre. It is a huge room and they set up tables for us and provide coffee too. Last night some big band (think Tommy Dorsey, or if you are too young for that Big Bad Voo-Doo Daddy). That was awesome! My dad (now 82) still plays in a Big Band (General Assembly). He plays the baritone sax. So needless to say, I have grown up with Big Band music! I love it and strangely enough so does DD2. Many of the same people from the CL group are also a part of the CHVQ group (and , yes, I am in charge of that group too!) The CHVQ group does not need me as a leader so I get to do some actual sewing, shocking, huh? Well, I am always on the look out for good group projects for the CL group and I had found the Chubby Chicks pattern (it is kind of a bad photo of the pattern but...) So I had mentioned to the CL's on Tues about this one and asked if anyone had any lime green fabric we could use. Ruth-Ann (who tells me I am not posting nearly frequently enough, btw) came through, BIG time! Here is her stash of lime green and she donated it all to us to use, isn't that fab?? It should be a cute quilt when finished. The CL's (some of them) don't like to applique, in fact they call it the "A" word, lol! so this has both applique and piecing. Here is what I was working on last night. My Fresh Squeezed blocks. Yes, they are still not finished yet, but they are now 21 blocks closer to finished! This is the Secret Ocean quilt that I can show you but can't tell you who it is for! The CL's all worked on this as a group project. Isn't it beautiful? I love blue and greens together anyway but this one is just exceptional. The photo truly does not do it justice. Here is a close up of the quilting. LTW did Water World on in with varigated blue thread. Tonight I have someone coming to give me an estimate on new carpet for the stairway and upstairs hall and DS's room. I hope it is affordable, we really need new carpet in those areas. Last night I had quilting with the Church Ladies (CL's). We had 3 new ladies show up last night and these two on the right were new a few weeks ago. See Judy in the pink? She is from Wales. I am involved in the Secret Santa Christmas Swap on Chooky Blues blog and have been taking the time to visit all the other swappers (you never know who or what you will find and it is fun! Take some time and explore the blogs there.) Come to find out one of the swappers is from Wales. Not only that, but from where Judy grew up! Small world, eh? The 2 with their backs to the camera were new as was the woman in the foreground (Stacey). Hey, you can see the orphan star on the table there. I brought it for Dolores to put the hanging sleeve on and turn the binding for me. Wow, they sure spoil me! I got lots more blue and yellow string blocks back last night with promises of more to come. We had quite a crowd last night and that was fun. The only problem was that I never got a chance, in 2 hours, to get anything done for myself. Oh well, such is the life of the "leader", right? I got 4 quilts for LTW, 2 from our group for the Christmas sale and one from a CHV lady and one from a man who's mom made the top and is now passed and he wants it finished. He donated a lot of fabric, books and notions to our group so I figure the least we can do is help him out. Last week he brought some muslin for the back so yesterday before the meeting I sewed the 3 strips together (this quilt is huge). Then tonight he brought the top and some ideas on how he wants it quilted (I'll just leave that up to LTW, thankyouverymuch!!) So I was lugging in my IKEA bag today. Poor LTW, she will never make it out of her quilting sweat shop with friends like me! I'll try to remember to take some photos tonight too. I finished the second orphan star and gave it to LTW. I told her I wanted Celtic knot work in the "star" and radiating lines in the blue part of it. So here is what she came up with. She quartered the square block to make it fit in the triangles, clever, huh? I just love how it turned out! I was going to sell it in the Christmas Craft show but it never made it out of the lab as someone there bought it and I have an order for another one! Not a bad deal, right? I have been a busy gal working on the "middles" for the Big Ten quilt too. I had to get OSU and Illinois finished to give to LTW to do the embroidery on. I also gave her a blank white piece of fabric to embroider the NW wildcat on. She, of course, gave them all back to me today so now I need to fuse the "N" around the cat. I got all the other middles fused too and all the "kits" for the blocks are ready. Or so I thought. I need to cut sashing for all the blocks too but I am not sure I have enough of the plain fabrics left to do that. We will have to see how it goes. I love seeing into the sewing rooms of everyone else so I thought I would share mine. You can see Mosen over on the arm of the couch. This is actually our living room but most of the time it is my sewing room. Unfortunately, this mess is the first thing you see when you come into my home. Where I am standing to take the photo is just as if I had come through the front door. Do you see the picture on the wall over the chair? It is a cat on a quilt. I got this long before I began quilting too! It is a beautiful print and my DH had the artist (NA Noel) write "You are my sunshine" on it and sign it. (He had that same saying engraved on my wedding band). The cats were full of it yesterday so you get to see the "fun". Here is Autumn, claiming Laxy's toy. The poor dog went to get it and the cat hissed at her! It was the funniest thing. Here you can see how the middles are turning out. I have to stitch around all of them now. That takes me a little time. Especially Penn State, Iowa and the Big Ten. These are the kits. Close up of Mosen on the couch. Isn't he cute? Here is Captain Jack closer up. The only cat not in the room with me was Hallie. He is the BEST sleeping cat ever! He just lays next to me and purrs and purrs until I am asleep. I have a lax parent meeting tonight and then quilting on Tues with the CL's and on Wed with the CHV ladies. I hope you are all having a good week! Here is a Halloween swap I am considering joining. Let me know if you join it it too. I just have to decide if I have the time. Every year the women I work with make a Big Ten quilt for the U of M quilt raffle. 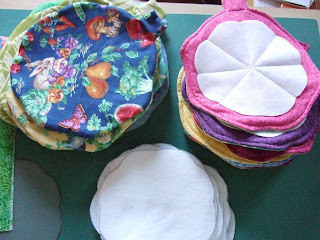 Today Robin and I took out all the fabric and made our pairings. I need some MSU green but other than that I am all set. The green in the "focus" fabric is an odd green so I am having some trouble matching it. All the centers of the blocks are appliqued (guess who gets that job??) and so I need to get right on that. I will do the tracing on fusible tonight and maybe cut and fuse all the middles. Then I will have to stitch around each of them. I will cut the fabrics into "kits' for each block and then when the group of us get together we will all sew the blocks and "someone" will put it all together and then we will give the whole thing to LTW to quilt for us!! It is a fun day, but I have to have it all finished by Oct 5th since that is when we are meeting. So you see, I just don't know if I will have time. Have any of you met Cori yet? Please take a minute and stop by and say hi to her!! Well, I finally finished the Witch's Pantry! I am very happy with how it turned out. Now I just need to give it to Liz with how I want it quilted. It never ends, does it? Here is the close up of the broom. I like how it turned out. I think the "Cat-O-Lantern"and the Jack-O-Lantern are adorable! Here is my cat. 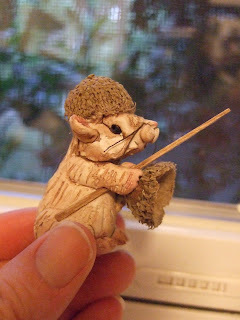 I used gold perle cotton to go around the cat and the mouse. I saw this display in Sam's club. I just loved the spooky graveyard. See the spider on the left? It is spinning something up for dinner later! On Sunday the Rotary Club of Plymouth puts on a mamoth Chicken BBQ. Here are my friends Debbie on the left and Terry on the right (with me in the middle). Deb did the am supervision of the lax boys. The entire BBQ is done using volunteers. Our boys lax team sent 29 (out of 34 possible) boys and several parents to help out. The photo was in the staging area. Here is some of the corn. The dinner consisted of half a chicken, an ear of corn, a roll, a bag of chips and 2 hot chocolate chip cookies! The Rotary Club recognizes the volunteers and also donates money to each group that helps out. The more people that help the more money they give! It is a win-win for the teams as it has the boys doing the work rather than their parents and helps the Rotary Club put the whole thing on! Here is a view of one row of the cooking pits. They are made the morning of the event by strong people and then the coals are started and the cooking begins. There are 2 rows of these pits. It's pretty amazing! Anyway, that's how I have been spending my time. I was also wrapped up in the GOP convention. I just love, love love Sarah Palin! DH and DS went to the McCain rally on Friday. It is good to see DS take an active interest in politics and how the world works! DH and DS have been out looking for a car that DS can use this year. 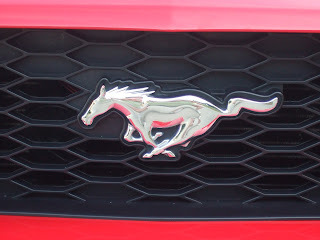 They were thinking Mustang, I was thinking way cheaper that Mustnag. You can't override the genes of a just turned 50year old and a 17 year old shopping together now can you. I believe it was mere folly on my part to think we would have anything other than exactly what we got. 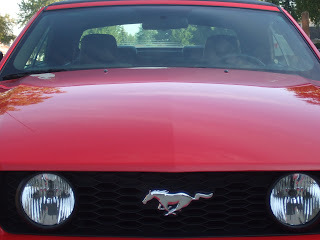 Yes let me introduce you to Mustang Sally! 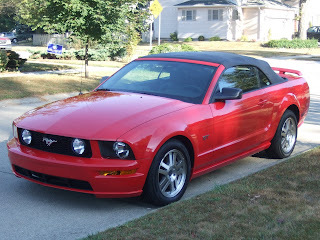 She is a 2005 Mustang GT convertible and she had only 18,000 miles on her and she is now OURS!!! This is just trouble, you are thinking? You might be correct. DS took her up north on Saturday to meet the family. The DD's and my dad and sister were going to my dads "up north" place. Well, DD1 calls and says let me talk to dad. Hmmm, why do you suppose that ws? Because DS got pulled over going...anybody want to guess??...95! He must be the luckiest guy alive because the police officer did NOT give him a ticket!!! Can you believe that? BUT...and it's a huge BUT...I think (hope) DS realizes it now. We told him this car has to be the most boring car ever to drive because it is such a cop magnet. Now he gets it (I hope). Needless to say when he arrived home yesterday, he told me that he drove 55 all the way home and had old people flipping him off for driving slow!! But, he said, "At least I looked cool!!" So everyone...meet the newest member of our household...Mustang Sally!! Welcome to our family, Sally! Whew, you might think the fun ended there, right, but no. I uploaded these in the wrong order so this is what I did on Sunday. 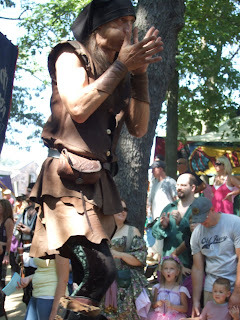 DH and I went to the Michigan Renisance Festival. 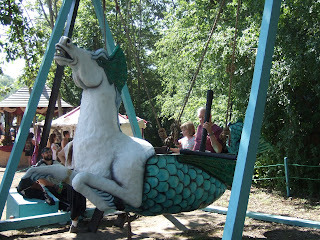 Isn't this swing neat?? Many of the people attending dress up. There are people that work there that dress up too. 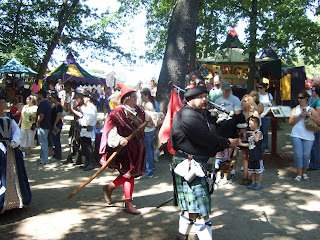 This was the bag piper in the front of the parade. 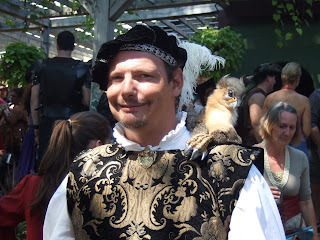 This man had a Griffin on his shoulder and it could move and everything!! DD1 has one of these, they are very cute! He was a giant kind of guy on those stilt things. I walked around and looked at many things. I found some Christmas gifts (can't show you though as those are for some people that read this blog! 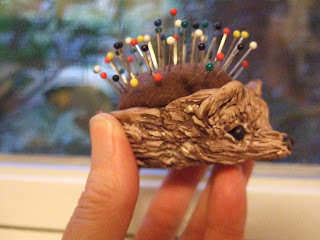 I was delighted to find this little Hedgehog pin cushion. Isn't he the sweetest thing? In the same booth there was this little fighting mouse. He has an acorn top for a hat and for his shield. He also has a toothpick for his sword. Adorable. They had a little bunny on a stick, well the stick was coming out of it's head and there were feathers coming out of the bottom of the figure and he was a ...Dust Bunny!! Ididn't buy him but if I make it back I sure will. Super cute! Now on Saturday, I spend the day cutting out needle cases, for the craft show, for some lucky Christmas gifts and whatnot. I got some of them sewn together but ran out of batting scraps for the inside. I figured out that the cotton batting works much better than the polyester stuff but I only had a little bit of scrap of that. I need to get the velcro for the closures too. I think I cut out about 45 of these and got maybe 15 done and waiting for the velcro. Not too bad. This last picture is for Faith. 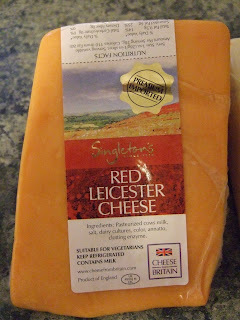 I went to the grocery on Sun when we got back and wanted to get some cheeses that we had not tried before and saw this one. It is from the city where she lives, Leicester!! Small world, huh? It was excellent cheese! Ah, now it is to the more mundane things that I have to do to get ready for the week. I need to do laundry and clean up a bit. I have to run some errands to get stuff for "back to school" for my DS too. Poor Dh he left this am with a load of the girls "stuff" to make deliveries all over the state. First to E Lansing to unload some stuff and pick up DD2 then to GR to get DD! and my dad's BIG van and go to the storage unit to unload and reload. From there to EL to unload the stuff from GR, back to GR to drop off the van and then home. He left around 9am this morning and will probably not be home until late tonight. He is a good guy to do all this for his girls. I hope they appreciate his effort!